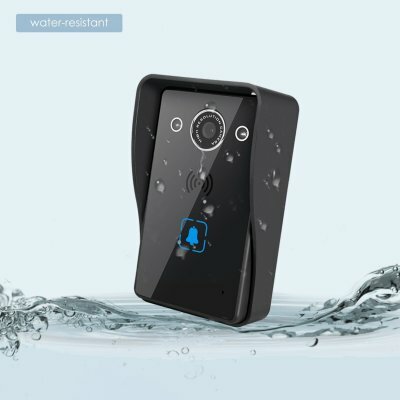 Successfully Added Video Doorbell - CMOS Sensor, APP Support, Night Vision, Dual-Way Audio, Remote Unlock, HD Footage, 3000mAh Battery to your Shopping Cart. Easily keep track of who’s ringing your bell with this video door bell. The doorbell itself is very simple to install and can be used together with your iOS or Android phone and tablet. Thanks to this, you’ll be able to keep an eye on who’s in front of your door even when you’re not around. With its 1/3-Inch CMOS sensor, this video doorbell treats you to crisp HD footage at 720p. It features a 135-degree wide angle lens thanks to which you’ll be able to see everything what’s happening in front of your door. With its 3000mAh battery and ultra-power-saving design, this doorbell lasts for up to 8 months on a single charge. With its Dual-Way audio support, this doorbell makes it easy to communicate with the person who rang your bell. The smart video doorbell supports both audio and video calling. Thanks to its night vision support, you’ll be able to use this smart home accessory at both day and night. With a remote unlocking feature, this smart doorbell allows you to easily unlock the door for visitors without you needing to get up out of your chair. If you’re looking for a state of the art doorbell that offers both security and convenience, this little gadget is what you have been looking for. Thisvideo doorbellcomes with a 12 months warranty, brought to you by the leader in electronic devices as well as wholesale smart home accessories..
Support remote monitoring, remote video, remote talkback, remote unlock.